New HTML5 gamedev book, Pro HTML5 Games. Ever wanted to create an RTS? As you can see by the volume of posts here on GameFromScratch.com, I took a bit of a holiday during the, um, holidays. During that time I did do a fair bit of reading. One book that came up on Safari is Pro HTML5 Games ( Safari link if you also subscribe ) that got my attention. Now, there are a ton of HTML5 game books on the market, of which I’ve read quite a few, but this one is kinda special. It actually shows how to create a Real Time Strategy ( RTS ) game in HTML5. I don’t believe there has been a book on creating an RTS since the title Real-Time Strategy Game Programming way back in 1999. A book I owned by the way and it was awesome… or at least according to my memory of 1999 it was. If this book sounds interesting, be sure to check it out. Keep an eye here for a possible upcoming review. Game developers love what they do because of whizzy graphics and clever technical ideas, but creating games boils down to one hard reality we all know and hate to admit: the entire process depends on the robustness of the game tools pipeline. This book is all about that pipeline and the tools that support it. And that simply means one thing: if you’re a game developer, you must have it. Written by developers and researchers, the book offers tips and tricks relating to asset and data management, geometry and models, Web tools, and programming. A wide variety of subjects covered. Over-all the book is fairly short at approximately 250 pages. There is a fairly large amount of preview available on Amazon if the above topics sound interesting to you. No reviews are available as of yet. If you pick up this book, let us know what you think. I have added a pair of books, and replaced a duplicate entry with a different book on the Unity 3D Book Round-up. Another two Unity 4 books have been announced with release dates in March of 2013. The first newish entry is Essential 3D Game Programming which replaced the duplicate entry of Unity 3.x Scripting on the list ( thanks for the heads up in comments! ). This book has been on my radar for some time but had minimal information, now there is a bit more available. That said, something about this book is really setting off my warning alarms… starting with the fact the artist on the cover graphic doesn’t match the author of the book. Caveat emptor and all of that! The other two are from established publishers, so no concern in that regard, both are upcoming books on Unity 4. The first is Learn Unity 4 for iOS Game Development published by APress. The second is Unity 4.x Cookbook published by Packt Press. Oddly enough, this book isn’t yet up on Amazon. Will edit the links when this changes. As stated earlier, both of these books ( as well as Beginning 3D Game Development with Unity 4 all ship in March of 2013. Things have been ultra quite on the Unity book front, perhaps the market was over saturated with books. Today however I have added the first new book in a couple months and the first book covering Unity 4, Beginning 3D Game Development with Unity 4 by Sue Blackman. 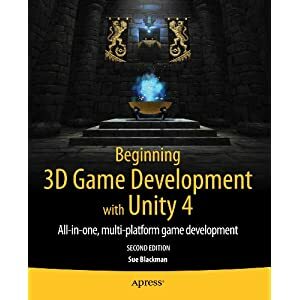 If that author or book title sound familiar, they should, Sue already released the book Beginning 3D Game Development with Unity, the very first book on the list. Now the catch… the book’s release date isn’t until March. All the same, it’s nice to see some Unity 4 books starting to show up on the radar. As of right now, I don’t have Table of Contents information to share, but the following is the book description from the publishers website. So, if you are looking for a Unity 4 book, consider checking out this one. Looking for the perfect gift for the geek who has everything? 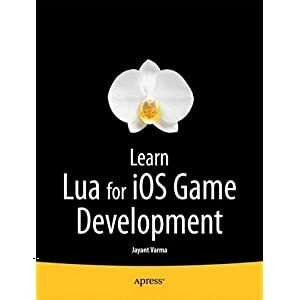 Well, Learn Lua for iOS Game Development is coming out just before Christmas , plus it’s on sale for 25 bucks. ( What’s with pre-release books already being on sale??? ). Alright, hundreds of computer texts are released every year, dozens of them about game programming… so why the interest in this particular book? You may remember a while back I put together Battle of the Lua Game Engines: Corona vs. Gideros vs. Love vs. Moai and I actually enjoyed working with all three technologies. Well this book covers using all three SDKs as well as Codea which I hadn’t heard of until this point. Obviously the book isn’t going to cover any of those technologies in detail, each one could probably merit it’s own book. It should however teach you the required bits of Lua and expose you to a little more detail than my comparison. Lua is a wonderful little language, one you should certainly look into if you haven’t already. This book may just be the right introduction, it releases on December 17th. Most APress books end up on Safari Books Online, so expect a review shortly after this book is released. It does strike me a bit odd that they would limit the title to iOS games, when Corona, Gideros and Moai all support Android as well ( without change in most cases ) and I don’t believe Love supports iOS at all…? So if you are interested in Android development, don’t let the title put you off.